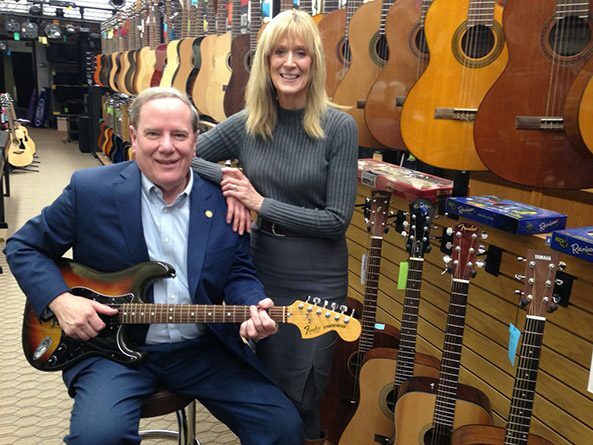 Above: Sen. Mike Moser with his wife Jan in their Columbus music store. Moser always had a love of music, and still does, and was happy to leave his job selling appliances to take over the music store. “The opportunity to call my own shots and run my own organization was too tempting to pass up,” he said. He had the drive and a plan, but what he didn’t have in 1977 was cash. The previous owner of the store was ready to retire, and knowing that such an opportunity may not come around again, the Mosers decided to sell their home and move into an apartment. “We’d just built a house, and we needed the equity to get the business loan,” he said. It was a gamble well worth taking. The store is still going strong four decades later, even in an era when online purchases have challenged many brick-and-mortar retailers. “A lot of people buying a guitar like to have it in their hands,” Moser said. So, too, does Moser. His favorite is a 1982 Fender Stratocaster that he uses on stage with Cruisin’—a four-piece band that plays about a half-dozen gigs a year. They cover Elvis, the Everly Brothers, some older country and a variety of other music. Moser addressed a variety of infrastructure issues during his 12 years as Columbus’ mayor. During his administration, the city built one viaduct and approved construction of a second over a mainline railroad track, expanded the water treatment plant and completed an arterial street on the city’s north side. “We tackled a lot of long-festering problems,” he said. He’s hoping to bring that problem-solving ability to the Capitol. Moser succeeds Sen. Paul Schumacher, who served District 22 for the past eight years. Schumacher supported Moser’s candidacy, but their relationship predates politics. The two were on the debate team at Platte Junior College, now Central Community College, in Columbus and were part of a four-person squad that competed around the Midwest. “We’d be gone 15 weekends a year. It was a lot of fun,” Moser said. That’s a skillset that no doubt will serve the new senator well, but on one issue there’s no debating Moser: anyone, regardless of talent and experience, can pick up a guitar. “I think anybody can play well enough to have fun,” Moser said.